“Exegetical Notes on Calvinist Texts” is the next essay in Grace for All. It is written by Grant R. Osborne, professor of New Testament at TEDS (link). Osborne is also a prolific author, having written numerous commentaries and books, including the Hermeneutical Spiral (a Christianity Today 1993 Critics Choice Award winner). For Osborne, theological problems are the result of “proof texting”. The problem is that in the past, systematic theology has by and large taken passages out of context, grouped them together in a logical order, and in many cases made them say things not intended by the original authors. If “proof texting” is the problem, then what is the solution? Does that mean there is no place for systematic theology? Before we tackle that question let’s make sure we understand what it meant by the terms systematic and biblical theology. organized on principles of logic, order, and need. It is concerned with how the whole Bible logically coheres in systems of thought. This article, rightly, notes that “everyone holds to some sort of [systematic theology]”. we take every passage in its own context and interpret it in light of the author’s intended meaning. We do not place a verse from John next to a verse from Hebrews and interpret one by the other; rather we allow John to speak for himself and the writer to the Hebrews to speak for himself. The article from the NIV Zondervan Study Bible goes on to explain that each approach to theology (systematic and biblical among others) serve as feedback loops for each other. but they shape the process whether one likes it or not. It’s absurd to deny that one’s [systematic theology] does not affect one’s exegesis. 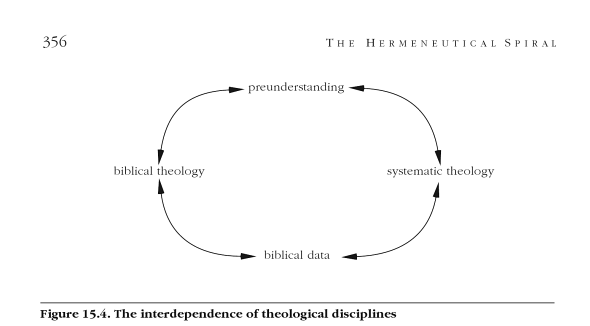 These feedback loops are illustrated by Osborne in his book, Hermeneutical Spiral. So, if biblical theology is the answer, it does not mean that there is no place for systematic theology. It just means that we must work at letting biblical data inform our systematics, which is in turn informed by our biblical theology. For more information on the differences between systematic and biblical approaches to theology I recommend this recent post at TGC (link). This post, from which I got the quotes attributed to the NIV Zondervan Study Bible, explores these topics in detail, tackling the question of how we approach trying to “make sense of parts of the Bible as a whole”. The rest of Osborne’s essay in Grace for All does not delve into how we integrate different theological approaches to best understand a passage. Instead it explores several passages that are typically used as proof texts in the debate between Calvinism and Arminianism. It summarizes what each means, at least as Osborne understands them, in the context of the book they appear in and the themes found in other books by the same author. Osborne then takes what he learns from doing biblical theology and makes a case for the systematic understanding of soteriology offered by Arminianism. This entry was posted in Blogging Through a Book and tagged Arminianism, authority of scripture, Calvinism, Grace for All, Hermeneutic by MikeB (@AnAgileJedi). Bookmark the permalink.